Discover how the Projects Report can help you to stay on top of your projects and hit your budget and deadlines. 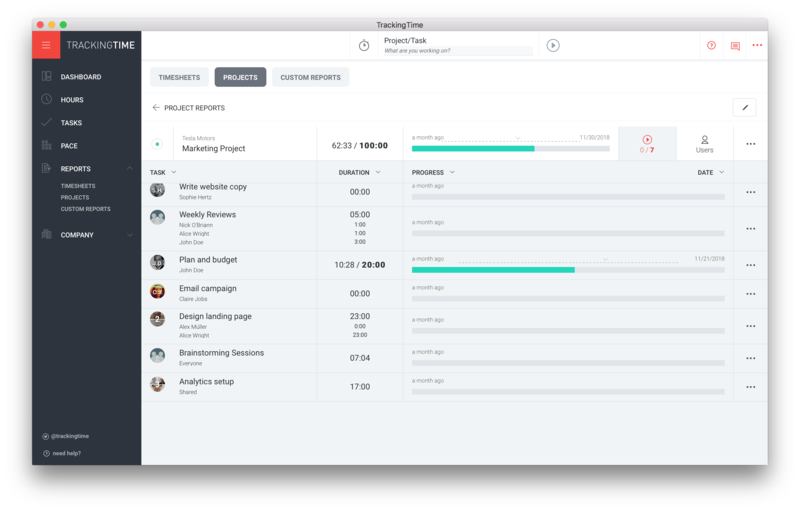 Moving your projects forward while hitting your budgets and deadlines isn't always easy. Here's where the Projects Report comes into play. It's designed with service-oriented companies in mind that work simultaneously on several different projects for different clients. The report gives you an overview of all your currently active projects. You can see at a glance how many hours are allocated for each project and how many hours the team has already worked on each project. 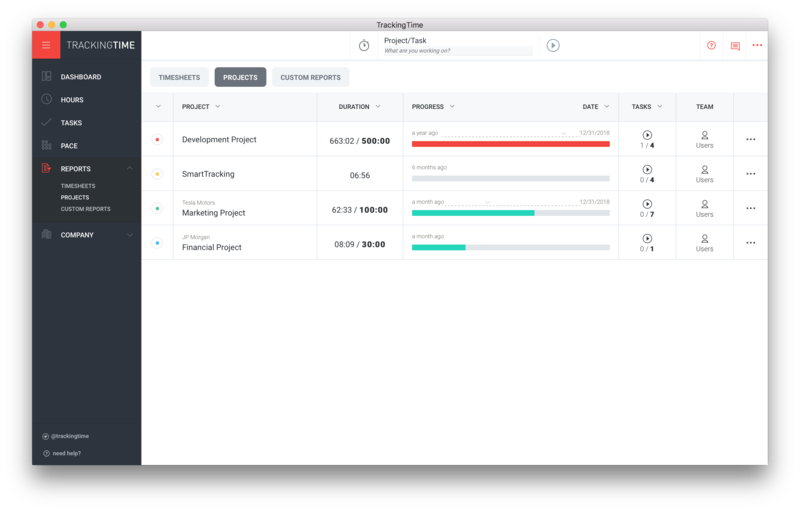 The colored progress bars allow you not only to compare worked versus estimated hours, but also shows you how close each project is to its deadline or delivery date. The tasks column shows you how many project tasks are currently closed versus open. Click on a project's name to access more details. The tasks section gives you an overview of all currently active project tasks. 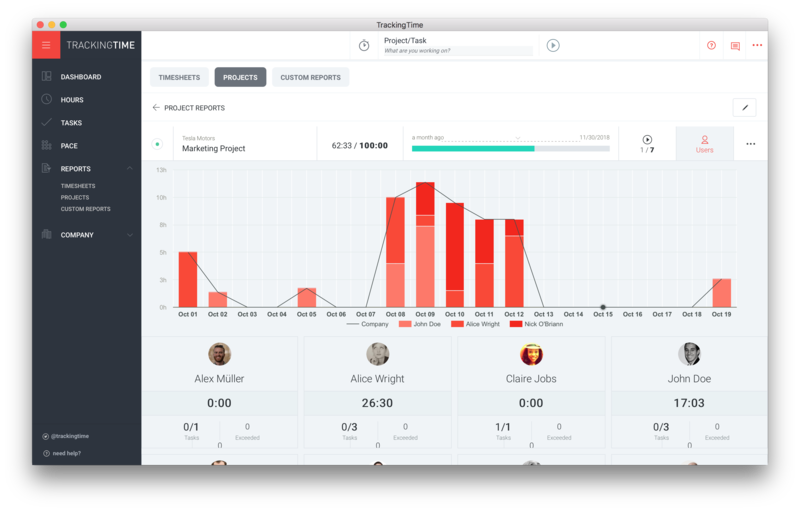 You can see how your project team is distributing their time across their tasks, worked vs. estimated times as well as the tasks' due dates. Click on the . . . buttons to edit the task details. Click on the table's column headers to sort the projects tasks by name, duration, progress or due date. Finally, the users section allows you to compare the performance of each and everyone of the project members. The bar chart below shows you total hours worked by each project member per day, from the project start until the last day somebody worked on the project. The user cards show how many hours each project member has contributed to the project, how many closed / open tasks are currently assigned to him, how many of his tasks have exceeded their estimates and on how many tasks he's missed the deadline.